I'm beginning to get the suspicion that our joint lives are going to be punctuated by dramatic changes of direction. June of this year presented us with an opportunity to make another life-changing decision and we leapt at it with surprisingly little hesitation. Whether it turns out to have been a misguided delusion or an inspired dream remains to be seen. Our lease renewal notice arrived mid-June and sent Sterling into his usual spin about the Dickensian property management company we have been dealing with. In the middle of their renewal letter they just happened to mention that the lease terms had been changed but failed to say in what way. To cut a long story short, it was our reluctance to sign the new lease and the reality that we would be penalised big time if we broke it, that finally pushed us onto the road. Now, I'm not trying to give the impression that it was solely a mean hearted Scrooge figure that drove us out of our stationary abode. Since the brain tumour episode earlier in the year, we had been seriously reconsidering what we wanted to do. One thing it brought home to us was the reality that there are no guarantees of tomorrow. We had been hankering after the dream of unlimited travel for some time and had the sense that it was something we'd do "at some point". One of the repercussions of the January bombshell was that we realised "at some point" needed to be now. 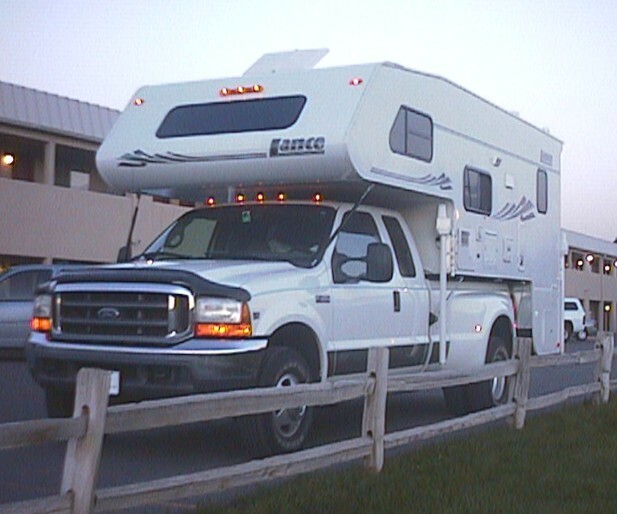 Saturday the 22nd of June saw us heading for Grand Junction and by the time we returned to Glenwood that evening we had bought a truck large enough to transport the entire human population of Wyoming, and ordered a camper. We were a little stunned by our own actions and I suspect looked like startled rabbits as we drove home. There seems to be a real difference between knowing you're going to do something and actually putting it into action. This sense has certainly come back to us since we left the apartment! The following Saturday we picked the truck up and some of you will recognise the picture of the beast, with the life size Teresa dwarfed next to it. 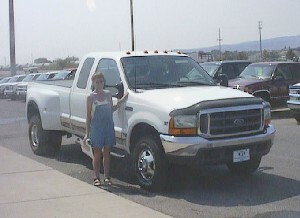 I have never thought of myself as small but have had to reconsider my self-image since buying this monster. It has to be acknowledged at this point that most English cars, and roads, are built on a different scale than American ones - it being a small island. Consequently I had never driven a tank replica on public streets or anywhere else for that matter. Needless to say the very prospect of trying to manoeuvre it in small towns and car parks filled me with fear. It also quickly became apparent that Ford did not intend women of just above average height to drive their manly vehicle. With the seat as far forward as possible I can just reach the pedals but my knees are up against the fascia under the steering wheel. The gear stick is as long as a yard-arm and only a daily Popeye size portion of spinach will ensure the strength to shift it. It wasn't plain sailing for Sterling either. It took us both a good month to feel anything approaching comfortable with it and luckily we didn't hit anything or anybody in that time. In the middle of packing up the apartment we went to take delivery of the camper. We were filled with a mixture of excitement and trepidation. As the weeks had passed we were overtaken with concerns. What were we doing? How could we live in something the size of a shoebox? What if the satellite Internet connection didn't work? Etc, etc, etc. Getting the camper and trying it out for a few days laid some of these worries to rest and of course raised a plethora of others that we hadn't even thought of up until then. The first three weeks of August turned into a trial of packing, cleaning, getting various pieces of equipment installed, making arrangements and generally being exhausted. A quick glimpse into a couple of those days: We anticipated that the Internet satellite installation would take four or five hours. There were problems with initial hookup and it took ten hours before it was resolved. The air conditioner installation was meant to take a couple of hours but never materialised as there wasn't enough clearance next to the satellite dish. We are now on the hunt for a small unit that will fit the space that we have available. Anyway, the upshot is that we had a hell of a time but finally took to the road in the late afternoon of the 26th August.